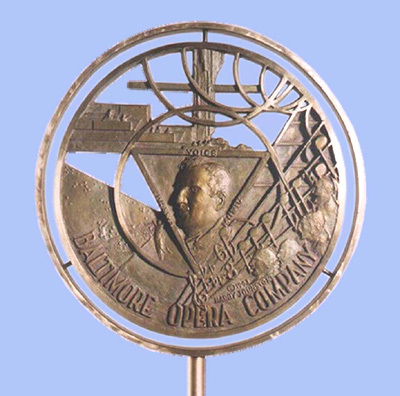 Carlos Bergunzi Award 1994, Bronze, 12" x 21"
Commissioned by the Baltimore Opera and presented to the renowned Italian tenor. The play of concentric circles, representing sound waves, interface with triangular and square shapes – integrating the design elements of the opera house interior, the stage of singers, and portrait of the maestro – as if applied principles of musical harmony. In exploring the principles of music, we can take the twelve tone series and divide the parts into two, three, four, and six, as a medieval architect might with a rose window. If the twelve tones are divided into four parts, giving form to a diminished core that resolves into several very different keys, the character of the composer gives that resolution substance. Music and visual art are incrementally interrelated. Dividing the twelve tones in three parts certainly produces three augmented intervals, but such geometric ordering only provides the tools for expressing the songs of the heart.